Friday May 28th 1920 I was down at Otts a couple of hours this morning getting the house in order for Fannie. I did some extra work around home after dinner. Wrote Lydia and at 4.30 Rob came and we started to Cedar Rapids to meet the girls. Ott and William went in their car. We all had supper. I rode home with Otts folks. Talked with Hattie till bed-time. Saturday May 29th 1920 Rob is 37 years old today. The girls got a nice dinner and Otts family were here. I went to town with Rob in the afternoon. Went to look about Wills picture and to see Dr Smith. Home at 5 oclock. Evening with Hattie. Sunday May 30th 1920 A beautiful day. The Whetstones took picnic dinner and went for a ride. I rested in afternoon and went down to Otts. Read in evening. Paul Helmich and Miss Harris called. The folks did not get home till ten oclock. Wrote Ella Hamilton. Monday May 31st 1930 Rob took us to the cemetery with flowers to decorate the graves. Hattie spent the afternoon with Fannie who is not well. I sewed for myself Cora to town after supper. Wrote Ella Rhodes Nagle in afternoon. 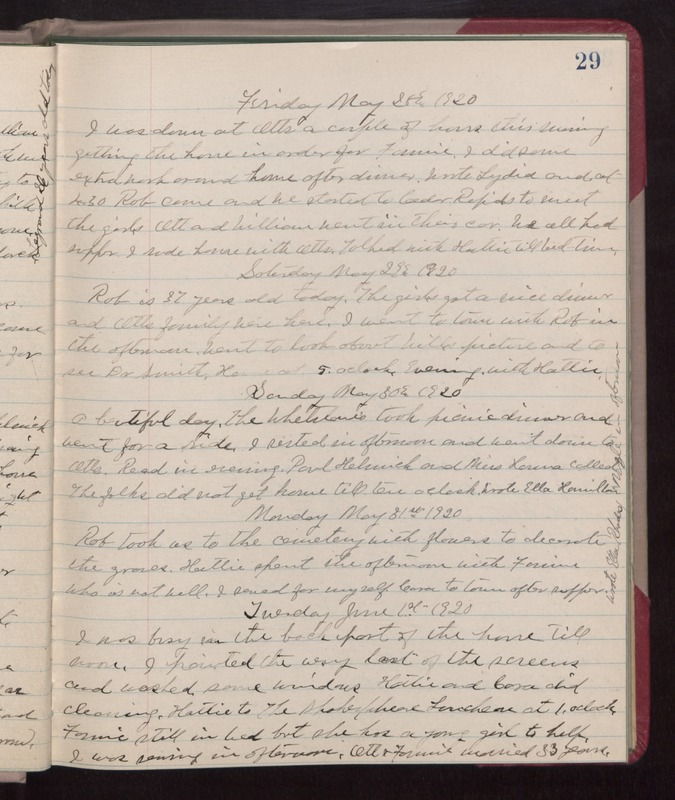 Tuesday June 1st 1920 I was busy in the back part of the house till noon. I painted the very last of the screens and washed some windows. Hattie and Cora did cleaning. Hattie to The Shakespeare Luncheon at 1 oclock. Fannie still in bed but she has a young girl to help. I was sewing in afternoon. Ott & Fannie married 33 years.